St. Vincent’s 100th anniversary - The Resident Community News Group, Inc. | The Resident Community News Group, Inc.
Nearly 400 years have passed since an aristocratic widow and a priest joined forces for good in France, but their original mission lives on worldwide. 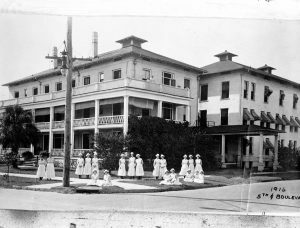 Now celebrating its 100th anniversary in Jacksonville, St. Vincent’s HealthCare would not be where it is today had it not been for the care and fortitude of the Daughters of Charity, an order established in 1633 by St. Vincent de Paul and Ste. Louise de Marillac. 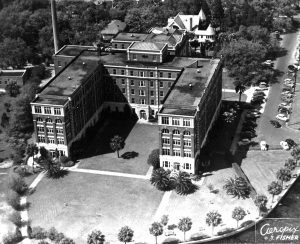 “From the beginning, St. Vincent’s HealthCare was founded on a Mission of compassion to provide care for those who were in need. The spirit of the Daughters of Charity is to discover the face of Christ in those whom we serve, and we invite our dedicated collaborators to do the same,” said Sister Jean Rhoads, Daughter of Charity and member of St. Vincent’s Board of Directors. “Each person’s life is uplifted when you realize serving here is actually a ministry…that what you do is making a lasting difference in this challenging world. I think that’s the reason the Mission at St. Vincent’s thrives! My hope for St. Vincent’s HealthCare for the next 100 years is that it remain deeply committed to its Mission and respond with vibrant creativity to the ever-changing needs of our brothers and sisters,” she said. 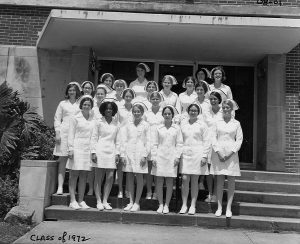 Almost 20 years after the nuns first came to Jacksonville to treat soldiers in a field hospital during the Spanish American War, they were asked to return in 1916 to take over the DeSoto Sanitarium in Springfield. They treated more than 600 patients during their first year at what would eventually become St. Vincent’s, named after the French priest St. Vincent de Paul. The Daughters of Charity left St. Vincent’s HealthCare two years ago to serve other ministries within Ascension, but their legacy lives on even as the torch was passed on to other associates within the nonprofit. It hasn’t been just all take, no give within the community. The organization has relied upon the time, energy and commitment of many volunteers, and has been blessed by financial gifts from many local philanthropists, enabling St. Vincent’s to expand services and maintain medical excellence. One such partner, First Coast Energy, has enabled the Mobile HealthCare Ministry to reach its own milestone. The program began in 1991, taking fully staffed doctors-offices-on-wheels to areas of the community which lack medical services. During its 2014-2015 fiscal year, the Mobile HealthCare Ministry provided free services to more than 17,000 adults and children. Another community partner, the Shircliff Society, brings together a group of young professionals to engage and inspire developing community leaders through the St. Vincent’s Foundation. Started in 2011, the Shircliff Society was named after Robert T. Shircliff, a tireless supporter of the Mission as well as a generous philanthropic leader. Along with the other leaders currently serving on the 10-member Board of Directors, Sidney S. Simmons, II, chairman, credits the Mission for guidance and for the healthcare system’s success 100 years later.